Sweet Floweret: Me Like to Eat COOKIES! Me Like to Eat COOKIES! 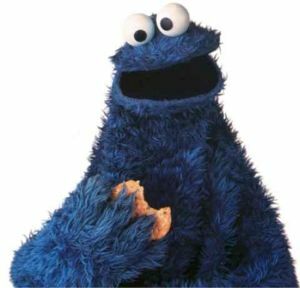 Ok, so tell me ONE good thing about the cookie monster? I mean, we all love him, but why? He ain't never learn to spoke right, and he LIVES on Sesame Street for crying out loud! He has a googly eye and only eats cookies. Well, he tries to eat them, but gets them all over the floor because he has no teeth. He's the rebel of the show. They keep trying to do skits on healthy eating, how to say your letters, how to be nice to one another... Then Cookie comes along and ruins it all. How can we expect any less from our kids if we force them to watch this big fat blue terror? I mean, look at him! I still love him. Which brings me to the great cookie blog post: three (scratch that, four) of my favorite chocolate chip cookie recipes. These are by no means "MY" recipes. I mean, does anyone create their own anymore? Don't you think it's funny that people take ownership of a recipe that Betty Crocker really came up with? All that to say, I don't deserve any credit. On with the cookies. The first recipe is a new one I'm loving. It's for chocolate chip cookies the size of your head. Well, maybe your kids head. Big, delicious and chocolaty-what more could you want? Preheat the oven to 325 degrees F (165 degrees C). Grease cookie sheets or line with parchment paper. Sift together the flour, baking soda and salt; set aside. In a medium bowl, cream together the melted butter, brown sugar and white sugar until well blended. Beat in the vanilla, egg, and egg yolk until light and creamy. Mix in the sifted ingredients until just blended. Stir in the chocolate chips by hand using a wooden spoon. Drop cookie dough 1/4 cup at a time onto the prepared cookie sheets. Cookies should be about 3 inches apart. Bake for 15 to 17 minutes in the preheated oven, or until the edges are lightly toasted. Cool on baking sheets for a few minutes before transferring to wire racks to cool completely. The next is for a really great basic chocolate chip cookie. Soft and delicious. My friend Stephanie gave me this recipe and it can also be found on All recipes with the title below. Stephanie uses mini chocolate chips and I really like them that way, too. Preheat oven to 350 degrees F (175 degrees C). Sift together the flour and baking soda, set aside. In a large bowl, cream together the butter, brown sugar, and white sugar. Beat in the instant pudding mix until blended. Stir in the eggs and vanilla. Blend in the flour mixture. Finally, stir in the chocolate chips and nuts. Drop cookies by rounded spoonfuls onto ungreased cookie sheets. Bake for 10 to 12 minutes in the preheated oven. Edges should be golden brown. 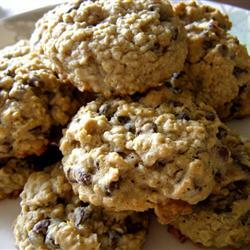 The next recipe is for Chewy Chocolate Chip Oatmeal cookies. I LOVE these. In a large bowl, cream together the butter, brown sugar, and white sugar until smooth. Beat in eggs one at a time, then stir in vanilla. Combine the flour, baking soda, and salt; stir into the creamed mixture until just blended. Mix in the quick oats, walnuts, and chocolate chips. Drop by heaping spoonfuls onto ungreased baking sheets. Bake for 12 minutes in the preheated oven. Allow cookies to cool on baking sheet for 5 minutes before transferring to a wire rack to cool completely. Ok, I said three. But I couldn't leave this one out. 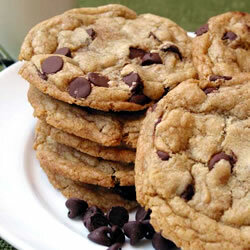 These are the kind of chocolate chip cookies that don't really flatten. They stay big and full and chewy and gooey. My friend Dani gave me this recipe. Use an ice cream scoop to shape cookies. Well, there you have it! Four chocolate chip recipes for your baking and eating pleasure. The dough is just as good, but since the salmonella threat is out there right now, be careful ;) Me hope you like them as much as Cookie do.